Housing a supersized order of fries or 20-piece box of nuggets behind the wheel may not be the most glamorous way to eat a meal, but you’re late, you’re hungry, and that combo meal isn’t going to eat itself. The trouble is, managing all the dipping sauces without dousing yourself in BBQ or ketchup (or skidding off the road) is a true challenge. Enter: the DipClip, an ingenious new dashboard accessory explicitly designed to hold your dipping sauces, like a special compartment just for condiments. 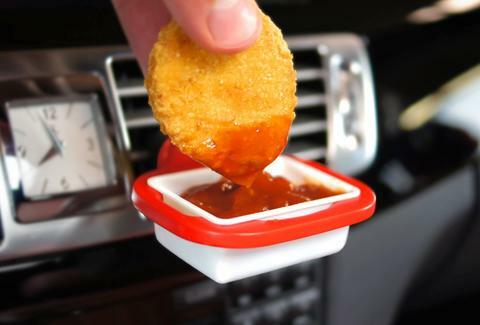 The device, which clips onto any style vehicle air vent, features a rectangular slot sized to fit most fast food chains' dipping sauce packets, and rotates a full 180-degree so you can easily set it at an optimal dipping angle from where you’re sitting. Each one also comes with a food-safe, washable dipping sauce-sized ramekin to squeeze smaller packets into should that be the sauce situation you find yourself in. Its inventors are currently raising money to manufacture them via Kickstarter, and have already nearly quadrupled their $10,000 goal. If you want in, you can pre-order right now for $15 to get a two-pack once they officially ship in March 2018. Until then, it's on you to be extra careful dunking while driving.